Lingering effects of extreme heat exhaustion suffered in the Sept. 2 running of the Bojangles’ Southern 500 at Darlington (S.C.) Raceway has sidelined Kasey Kahne for Sunday’s running of the Big Machine Vodka 400 at the Brickyard at Indianapolis Motor Speedway. 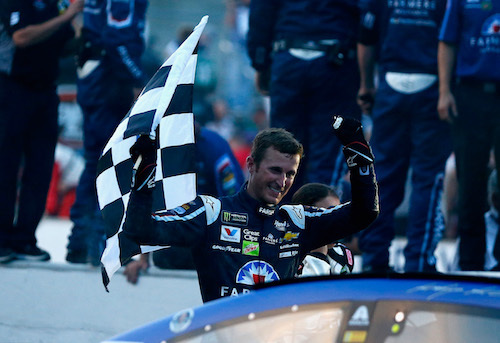 Kahne is the defending winner of the Brickyard 400. Regan Smith has been named the driver of Leavine Family Racing’s No. 95 Chevrolet in Kahne’s absence for the Monster Energy NASCAR Cup Series race at Indianapolis. A timeline for Kahne’s return to the driver’s seat has not been determined, according to the race team. Sunday’s race will be the first Cup Series race Kahne has missed since making his series debut in the 2004 season-opening Daytona 500. Meanwhile, the Brickyard 400 will be Smith’s first Cup Series race since he served as a fill-in for the injured Aric Almirola at Dover (Del.) International Speedway last year. His last race in any NASCAR national series was in the Camping World Truck Series season-finale at Homestead-Miami Speedway in November 2017. Smith has 213 Cup Series starts, including a win in the 2011 Southern 500 while driving for Furniture Row Racing. Kahne announced in August that he will retire from full-time competition in the NASCAR Cup Series at the end of the 2018 season. Ten races remain in 2018, beyond the Brickyard 400. His win of last year’s Indianapolis race while still with Hendrick Motorsports is his most recent of 18-career Cup Series wins. His 2018 season, his only season with LFR, has been a struggle, though. In 25 races, he has only one top-10 finish — a fourth-place showing at Daytona (Fla.) International Speedway in July.